41,572 Miles * Worth $20,000! Sale $17,995 - 2016 Ford Explorer * 1 Owner * Carfax Certified * 3rd Row Seat * Rear Camera * Bluetooth * Cross Traffic Alert System * Transferable Factory Warranty * Excellent Condition. Easy, Instant Financing! 6 Cylinder Engine, 3rd Row Seat, Bluetooth connectivity, backup camera, rear defroster keyless entry power driver seat, ABS Brakes,AM/FM Radio,Deep Tinted Glass,Lane Departure,Premium Aluminum Wheels,Rear Window Defogger,Tilt Steering Column,Vehicle Anti-Theft & more. This 2016 Ford Explorer has a new fresh interior and exterior design. The Absolute Black Metallic finish is in outstanding condition with no significant nicks dings or scratches. The interior is odor free and spotless. It still looks and smells like new! This vehicle has a new PA safety inspection with maintenance items consisting of brand new brake pads/rotors, oil service and even new wiper blades front & back! It also comes with the balance of transferable manufactures warranty to the new owner. There is a complete set of owners manuals/warranty books 2 sets of keys and a full set of floor mats. 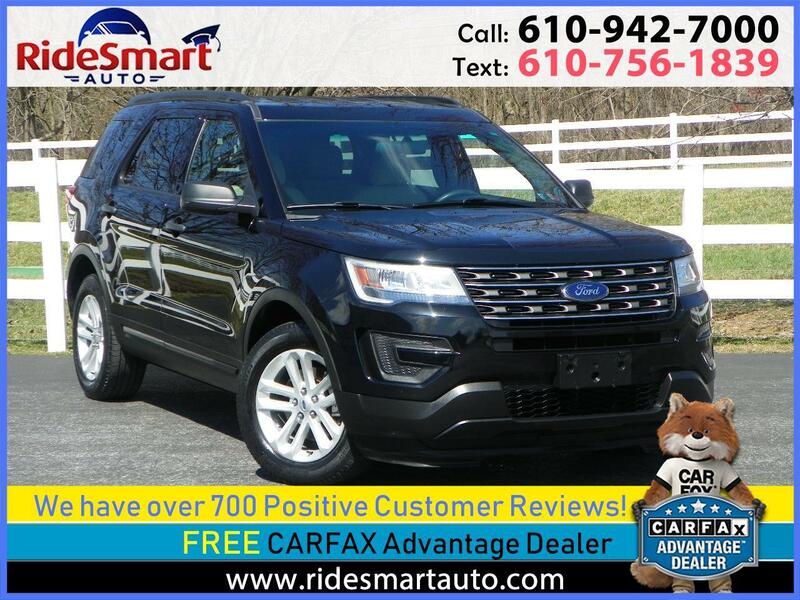 If you're looking for a newer lower mileage,3rd row seat SUV in outstanding condition, at a great price, this 2016 Ford Explorer is the one! We believe you will be 100% satisfied! Warranty Description: Balance of Transferable Factory Warranty. See Carfax Report for details.